The auto-grabbing system used so successfully on our original vessel 'Aquatech' has been re-designed to take advantage of the much larger work deck area on 'Aquadynamic'. The geometry of the specialised stern gantry enables autonomous delivery of samples from the seabed to a new sample processing table. We have taken many thousands of samples with both of our vessels using this unique system and the safety record is impeccable. The sediment grab is under full control at all times and is never suspended by the winch wire over any part of the work area. There is a safety bar between the grab and any crew member at all times, sample processing is carried out on a secure platform at a comfortable working height and there is a sturdy grab rail within arms reach of any position on the work deck. The processing table is equipped with a large area (750mm x 750mm) stainless sieve which is normally lined with a scientific net of appropriate mesh size. Two independently adjustable hoses supply sea water to the table and a formed, plastic chute takes the washings cleanly over the stern of the vessel. Samples are digitally photographed, sieved, fixed, sealed up and labelled on board. Digital cameras and a laser label printer are available on 'Aquadynamic'. Samples can be taken within a close tolerance if required (typically +/- 2 metres) and 'Aquadynamic' can stabilise over a station very quickly using her processor-controlled thrusters. Unique software is used to monitor the altitude of the sediment grab above the seabed and DGPS fix data is automatically written to disk as the grab leaves bottom. The data set includes position, time, fix number, water depth and water temperature plus additional entered data such as sample ID and description comment. 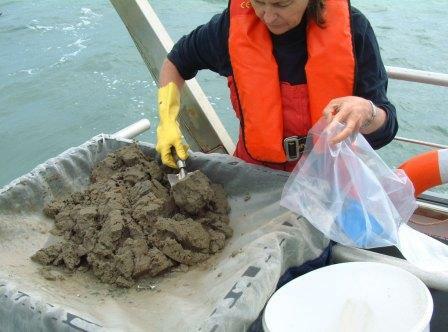 Samples can be taken in water depths between 2 and 80 metres with tidal flows up to 5 knots. Sea conditions under force 5 are acceptable and 'Aquadynamic' has worked safely in higher sea states at the master's discretion. 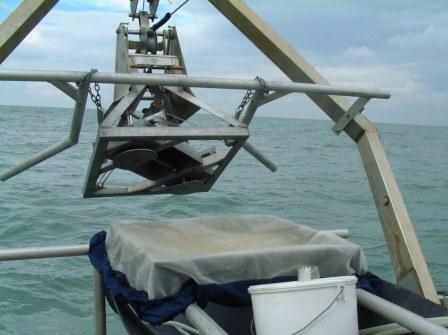 A wide range of seabed types can be sampled using either our 0.1m2 offset 'Day' grab or 0.1m2 mini 'Hamon' type grab. Where physical sampling is not possible (or desirable) we can provide high resolution, digital images of the seabed with enough definition to construct a biotope map. Our confidence in the efficiency of this system enables us to offer lump sum pricing on defined projects. Just provide us with details of sample numbers and positions and we provide you with an all inclusive price regardless of weather delays.